Sacred Geometry: The basic units of Roman architecture, the square and circle are emulated as representations of heaven and earth. In this third and final instalment of BBC Two's Renaissance Revolution, Matthew Collings returns to Italy to look at the Piero della Francesca's The Baptism of Christ(1448-1450). 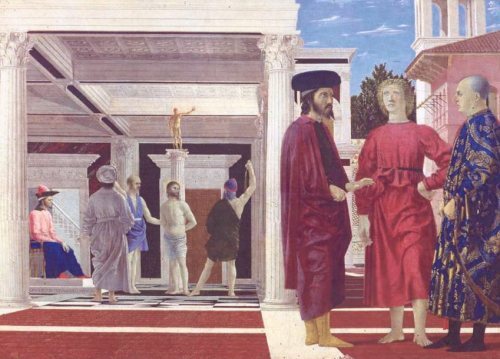 Of particular interest in this episode was Collings' exploration of the techniques used in Tempera painting and the application of perspective, which Piero della Francesca was one of the earliest exponents of. Piero della Francesca(1415-1492) represents an interesting time in Italian art - a period immediately before the High Renaissance, still steeped in the idioms of Medieval painting. 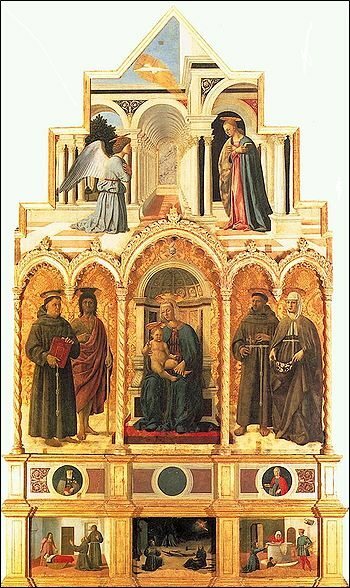 A wonderful example is the St. Antony altarpiece painted for a church in Perugia. The top and bottom panels demonstrate a more modern style, with the middle panel an homage to the Eastern and Medieval style of altarpiece painting. This is quite noteworthy, as a great deal of della Francesca's work was done for patrons wishing to reconcile the Eastern and Western Churches. Historically, this period of time is significant, as it was preceding the Fall of Constantinople to Ottoman Turks in 1453. Hence, works such as the The Baptism of Christ represent a plea for the Churches to unite against the threat of the Eastern Invaders. Edit: BBC iPlayer is no longer showing this program, nor it is it available for purchase from their store. Here is an excerpt. I am fascinated by his mention that there was a painting of god above the baptism painting. What a tragedy that it's been lost. Would love to see how that would have been handled. Great post as always! That detail was indeed fascinating Vicky - and I must admit that I was not aware of it until Mr. Collings mentioned it! I really enjoyed this series. It was about time we saw some Renaissance art programs that weren't just about the Mona Lisa, Sistine Chapel and Statue of David! H: My wife and I visited San Sepolcro ( Holy Sepulcher) a few years ago and found a small non-touristy town with the little Piero Museum tucked unobtrusively on a side street. I wonder if Alexandra has posted on the town. Piero's work is really fantastic and there is a very good Cambridge Companion to Piero della Francesca available in paperback. Frank.. you need not wonder, there is a place to search for that! David Packwood has also done an excellent summary of this program at Art History Today. Absolutely loved this - thanks a million for posting it. But I wasn't too sure if the futuristic, electronic soundtrack that accompanied his lectures on the paintings actually added much - I found the soundtrack to be a distraction. And I wasn't convinced that the purpose of the river is metaphoric (an imperfet mirrow of reality). I think it also has a technical function, to add a dramatic light effect to the scene. While I have no doubt there might be some 'river of life' metaphors and such for the Jordan, I think Francesca may simply have been trying to using it as a teaching tool of Matthew 3:13 and Mark 1:9, where it states that Jesus arrived from Nazareth in Galilee to be baptized by John in the river Jordan. In a culture and time where the Bible was available only in Latin, such images had to help teach. However, Francesca certainly takes some artistic license with the river. I do like the interesting reflections and background detail. Cheers for the comments P.M. Doolan and Jae! @Jae - nice to see you in these parts!! In an allegorical sense, the triumph of so many Renaissance works is the dual appeal they had, a rich blend of spiritual and humanist ideas that were so prevalent in the 15th Century. Hence, both readings are not only valid, but surely strengthen each others import. I personally find his work on perspective most fascinating - one of the true forefathers of using mathematical applications to mimic reality in visual form - just as digital artisans, architects, engineers etc. do to this day with programs like AutoCAD, 3DSMax, Maya etc. As for the music - as Collings' introduction indicates - I think he was deliberately being anachronistic in this sense to convey looking at Renaissance art as the modern art of its day. I think we're just too used to hearing a nice chamber music soundtrack on such programs - hence when something different pops up it's a bit jarring. A really fantastic book (well written and recent!) on this subject is "The Mirror, the Window, and the Telescope: How Renaissance Linear Perspective Changed Our Vision of the Universe" by Samuel Y. Edgerton. I very much look forward to perusing your blog!! Always delighted to find another Renaissance-centric site.